Much like a smile on a face warmly greets a friend, a beautiful front entry says hello to your home’s visitors. 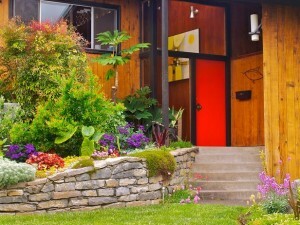 There are a variety of approaches you can take to spruce up your front door area including unique doors and windows, colored trim, etc., but a great way to add appeal to your home’s main focal point is with beautiful garden areas surrounding your front door. While many people think of garden beds as something reserved for the back area or around the base of a home, plantings flanking the front walkway, steps, and entry add a warm and fresh touch that nothing else can match. And with the right plants, the appeal can change with the seasons, and continue on even into the cold of winter. Mums and asters bring a color riot every fall, and evergreens and hollies provide a refreshing contrast to the snow each winter. Staggered planting of early and late-spring-blooming bulbs and ornamental grasses of varying heights means living tapestry is ever-changing. To get some inspiration for moving beyond the “flower bed beneath the picture window” look for your front landscape, take a look at this gallery of photos from HGTV. At Architectural Landscape Design, we believe in creating gardens and landscapes for Minneapolis homes which are as individual as the people who live there. If your front entry needs a natural touch, please give us a call.